Both standards are protected for up to 6364 kg (14,000 lb) of operating force by a 16-mm (5/8-in.) shear bolt. 25-mm x 686-mm (1-in. x 27-in.) standard model is compatible with Category 1, 3-point hitch tractors. 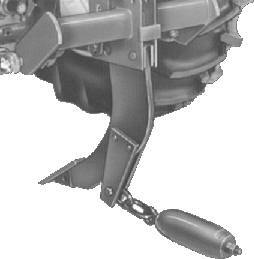 For Category 2 and 2/3N Tractors with Quik-Coupler, order AR27093. For Category 2/3N Tractors without Quik-Coupler, order one R64434 and two R66435. Standards may be ordered to convert the machine for different operational requirements. In the sales manual, see tractor compatibility and equipment requirements for restrictions. To convert from a 25-mm x 686-mm (1-in. x 27-in.) standard to a 32-mm x 838-mm (1.25-in. x 33-in.) standard, order N261789. To convert from a 32-mm x 838-mm (1.25-in. x 33-in.) standard to a 25-mm x 686-mm (1-in. x 27-in.) standard, order N261788 and A25273. 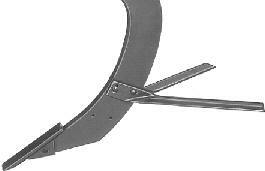 The heavy-duty knife attaches to the lower end of the standard to open up the sub-soil and shear the roots. Each knife is 610 mm (24 in.) long and will cut 267 mm (10.5 in.) on each side of the standard. The 76-mm x 8-mm (3-in. x 5/16-in.) blades are sharpened on the leading edge. The mole ball is used to make a tunnel drainage system. It requires BA24894 standard support attachment. The standard support attachment is required to attach the mole ball to the standard. 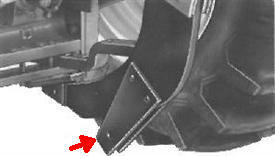 It also allows the frame to jackknife for automatic retraction and operation of the standard.